The idea was to fit the successful CHROMA HAIKU knife with an even better blade. Damascus blades perfectly fit the classic character of Chroma Haiku knives! 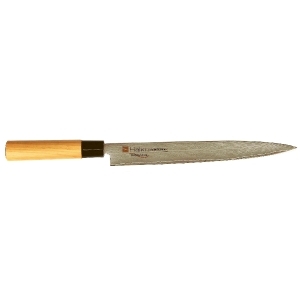 Sumikama is the foremost, and in all probability, the best, maker for Damascus Kitchen knives in series. Sumikama provides CHROMA in Japan with unbelievably sharp blades made from 32 layer Damascus an VG-10 core steel with a hardness of HRC 59-60*. At CHROMA in Japan, Sumikama’s knives are sharpened, polished, and mounted in Japanese Cherry Wood handles fixed in place by the signature Japanese Meguki. We have the seven most important kitchen knives from CHROMA HAIKU with the Damascus Blade. For almost any material you want to cut, we have the right blade.